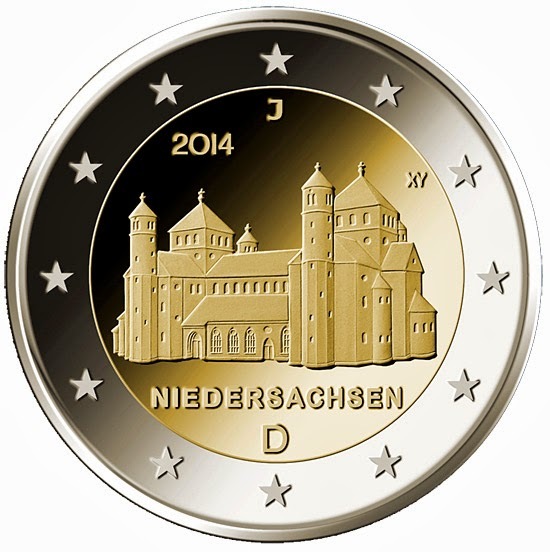 Designer: Erich Ott is credited with the design of the German 2014 €2 Euro Commemorative coin. €2 Edge Inscription: The German €2 coin edge inscription is "EINIGKEIT UND RECHT UND FREIHEIT" (Unity and Justice and Freedom), followed by the German federal eagle. A - Berlin National Mint ( Staatliche Münze Berlin ) in Berlin, Germany. D - Bavarian Central Mint ( Bayerisches Hauptmünzamt ) in München, Germany. F - Baden-Württemberg National Mint, Stuttgart Embossing ( Staatliche Münzen Baden-Württemberg Prägestätte Stuttgart ) in Stuttgart, Germany. G - Baden-Württemberg National Mint, Karlsruhe Embossing ( Staatliche Münzen Baden-Württemberg Prägestätte Karlsruhe ) in Karslruhe, Germany. J - Hamburg Mint ( Hamburgische Münze ), in Hamburg, Germany. while B, C, E and H used to be mint locations that had been closed prior to the introduction of the Euro. Germany started the commemorative coin series Die 16 Bundesländer der Bundesrepublik Deutschland (The 16 States of the Federal Republic of Germany) in 2006, which will continue until 2021. Coins will be issued in the same sequence as the annual rotation of the presidency in the 'Bundesrat' (upper house of parliament), in which the 16 federal states are represented. The coins issued are: 2 euro 2006 Schleswig-Holstein, 2 euro 2007 Mecklenburg-Vorpommern, 2 euro 2008 Hamburg, 2 euro 2009 Saarland, 2 euro 2010 Bremen, 2 euro 2011 North Rhine-Westphalia, 2 euro 2012 Bavaria, 2 euro 2013 Baden-Württemberg, 2 euro 2014 Lower Saxony, 2 euro 2015 Hesse, 2 euro 2016 Saxony, 2 euro 2017 Rhineland-Palatinate, 2 euro 2018 Berlin, 2 euro 2019 Saxony-Anhalt, 2 euro 2020 Thuringia, 2 euro 2021 Brandenburg. The Church of St. Michael (German: Michaeliskirche) is an early-Romanesque Lutheranchurch in Hildesheim, Germany. It has been on the UNESCO World Cultural Heritage list since 1985. St. Michael's Church is one of the most important churches of Ottonian times Ottonic (Early-Romanesque) style. It is a double-choir basilica with two transepts and a square tower at each crossing. The west choir is emphasized by an ambulatory and a crypt. The ground plan of the building follows a geometrical conception, in which the square of the transept crossing in the ground plan constitutes the key measuring unit for the entire church. The square units are defined by the alternation of columns and piers. Hildesheim is a city in Lower Saxony, Germany. It is located in the district of Hildesheim, about 30 km southeast of Hanover on the banks of the Innerste River, which is a small tributary of the Leine River. Lower Saxony (German: Niedersachsen, Low German: Neddersassen) is a German state (Bundesland) situated in northwestern Germany and is second in area, with 47,624 square kilometres (18,388 sq mi), and fourth in population (8 million) among the sixteen Länder of Germany. In rural areas Northern Low Saxon, a dialect of Low German, and Saterland Frisian, a variety of East Frisian, are still spoken, but the number of speakers is declining. Lower Saxony borders on (from north and clockwise) the North Sea, the states of Schleswig-Holstein, Hamburg, Mecklenburg-Vorpommern, Brandenburg, Saxony-Anhalt, Thuringia, Hesse and North Rhine-Westphalia, and the Netherlands. Furthermore, the Free Hanseatic City of Bremen forms two enclaves within Lower Saxony, one being the city of Bremen, the other, its seaport city of Bremerhaven. In fact, Lower Saxony borders more neighbours than any other single Bundesland. The state's principal cities include the state capital Hanover, Brunswick, Lüneburg, Osnabrück, Oldenburg, Hildesheim, Wolfenbüttel, Wolfsburg and Göttingen. The northwestern area of Lower Saxony, which lies on the coast of the North Sea, is called East Frisia and the seven East Frisian Islands offshore are popular with tourists. In the extreme west of Lower Saxony is the Emsland, a traditionally poor and sparsely populated area, once dominated by inaccessible swamps. The northern half of Lower Saxony, also known as the North German Plains, is almost invariably flat except for the gentle hills around the Bremen geestland. Towards the south and southwest lie the northern parts of the German Central Uplands: the Weser Uplands and the Harz mountains. Between these two lie the Lower Saxon Hills, a range of low ridges. Thus, Lower Saxony is the only Bundesland that encompasses both maritime and mountaineous areas. Lower Saxony's major cities and economic centres are mainly situated in its central and southern parts, namely Hanover, Brunswick, Osnabrück, Wolfsburg, Salzgitter, Hildesheim and Göttingen. Oldenburg, near the northwestern coastline, is another economic centre. The region in the northeast is called the Lüneburg Heath (Lüneburger Heide), the largest heathland area of Germany and in medieval times wealthy due to salt mining and salt trade, as well as to a lesser degree the exploitation of its peat bogs up until about the 1960s. To the north, the Elbe river separates Lower Saxony from Hamburg, Schleswig-Holstein, Mecklenburg-Western Pomerania and Brandenburg. The banks just south of the Elbe are known as Altes Land (Old Country). Due to its gentle local climate and fertile soil it is the state's largest area of fruit farming, its chief produce being apples. Most of the state's territory was part of the historic Kingdom of Hanover; the state of Lower Saxony has adopted the coat of arms and other symbols of the former kingdom. It was created by the merger of the State of Hanover with several smaller states in 1946.